Here it is! The finished product, ready to be presented. There is something very emotional in the final unveiling of the Mission. Invisible beneath this perfectly varnished and shaped helmet, there are dozens of prototypes and many years of development. It is not only the result of the combined effort of many teams, but also the sum total of all the experience we have accumulated over time, with the Tranz, Tranz 1.5 and the Titan. The family tie to the Mission and Titan did not come about by chance. In fact, the point of origin of the Mission lies in 2014 at the very moment of the development of the Titan helmet. According to the initial plan, the Titan was to be deployed in two different stages. In fall 2016, while the first generation of the Titan was breaking into the market, we were already approaching the completion of phase ll of the helmet, which was to be launched in February 2018. The project’s goal was to maximize the Titan’s performance for trail riding by adding a visor and by improving the aerodynamics of the peak. While the company was fine-tuning the adjustment of certain Titan components, it was imperative for our team to go through all the stages of the newly implemented de- velopment process. Consequently, despite the fast production of the first prototypes, we still did proceed to carry out a joint in- depth functional analysis with the marketing department that lasted from November 2016 to May 20017. This analysis allowed us to highlight several other upgrades needed to have a value-added product. One of the most important upgrades was to let the rider use the helmet with or without the peak. In the initial design, the helmet also allowed for replacing the peak with goggles. By combining these two features, we worked on developing a ratchet mechanism which would allow for removal of the peak and visor by pressing a single button. This unique system was the subject of a first patent application. Despite the added upgrades, in June 2017, we were continuing to work from the Titan’s shell. At the same time as the helmet was being developed, our team was working on a proof-of-concept for removing moisture-la- den air. All snowmobile helmet designers will tell you that moist air from breathing presents a serious challenge. As this air is almost impossible to eliminate, our team toyed with the idea of using different air pressures created by the movement of the snowmobile and driver to draw the humidity into a channel and to the outside of the helmet. Proof-of-concept often calls upon our craftsman-handyman side. In October 2016, the first trials were carried out on a motor- cycle. In May 2017, we were testing over- sized Air Management Systems designed from PVC pipes and duct tape. The positive results of our experiments encouraged us and the following month, in June, we were able to test three different models adapted for snowmobile helmets. Our results were conclusive: there was no doubt that we had to integrate this Air Ma- nagement System into the new helmet that we were working on. A patent application for the AMS system was submitted and the projects were merged together. However, to accommodate the AMS channels, we quickly realized that a considerable number of modifications would be needed to the existing shell. So, we had to redo the molds. The project was taking on a new direction: from the Titan’s phase II, the Mission would be born. The prospect of reworking the molds allowed us to review the shell’s design in terms of all the requirements revealed in our analysis over the last months. In addition to expelling humidity, the Mission essentially had to clear the mouth in a single movement when opening the visor, offer better protection from the cold and maintain a distinctive look with or without the peak. Our first prototypes based on the Titan featured the combination of the muzzle and a visor. However, integrating the AMS system needed air tight seal and required a very complex sequence to perfectly seal the opening. It was already evident, when reworking the clay in July 2017, that the muzzle would be replaced by a large visor. 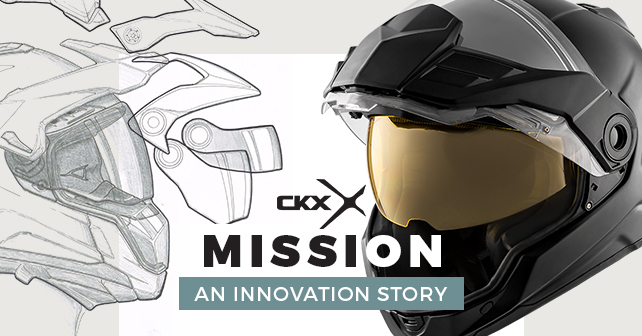 For a few years now, the engineering team can count on the expertise of Stéphane Dion, a helmet designer for over twenty years. Stéphane is the one who can create a picture of everything we can imagine. He is able to find the perfect balance between form and function. After multiple brainstorming sessions, Stéphane went to work to show the first sketches of the Mission with integrated channel profiling. Drawing his inspiration from the helmet of a jet fighter pilot, the visor was reworked to create the illusion of goggles. The bottom part of the visor, would allow to add ventilation ports and ergonomic breath box. Completing the hat trick, this adjustable and removable breath box was the subject of a third patent appli- cation for the Mission helmet. Despite the possibility of a complete redo, it was important for us to maintain a family tie between the two helmets. It was from the clay of the Titan that the Mission was designed. The Mission is the Titan's cousin. Despite the project’s change in course, the launch was still scheduled for 2018 and the clock was ticking. Through a partnership with a fluids mechanic university research group, the AMS system was tested in wind tunnel toevaluate air pressure, to define the ideal evacuation zone, and to optimize flow in the channels. During this time, we kept busy com- pleting the helmet’s CAD. At the end of October 2017, we received the first 3D printouts. Visits to our supplier allowed us to successively approve the production of molds and to supervise and verify the assembly of the first helmets. By mid-De- cember, we returned with the first helmets for testing, and immediately we went straight to the trails. After several tests on trails, the enginee- ring team came to the conclusion that the AMS system needed major revisions to optimize its performance in the various weather conditions our winters impose upon us. The project had evolved and required more time to improve the concept: we had to go back to the proto-typing stage. Taking advantage of the entire winter and spring, we tested the different pro- totypes in real conditions to improve the AMS’s performance. Still not satisfied with the results, when the good weather came, we doubled our efforts to modify the prototypes, testing them several times in a cold room over the summer. In short, the summer season was partly spent in temperatures nearing twenty degrees below zero, facing a powerful fan to recreate conditions encountered on the trails. This testing period under controlled conditions was the best way to document the effects of prolonged exposure to the cold on our helmets in real time. Back at the office, we worked on changes, and every time, we came back with improved prototypes. 2019 begins with a major accomplishment for the CKX team! Changing things and innovating comes with a certain degree of risk and, in that regard, the Titan adventure has enabled us to learn much about the realities of the market, but also about ourselves and our development processes. The Mission is the result of everything that preceded it. These are the main phases of the project which have been recounted. In the Mission are all the battles that lead to victory and all the doubts that lead to certainty. Our entire team is proud of our achievements. However, it is now, with you, that the true adventure begins. It’s up to you to go on a Mission!